Jerry Vilinsky began his career in education in the Parma City School District as a math teacher in 1969. Prior to coming to Normandy, Jerry coached multiple sports including football, basketball, and baseball. 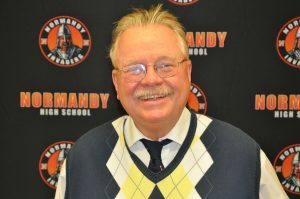 Jerry came to Normandy in 1988 where he served briefly as Athletic Director. He taught math until his retirement in 2004. In addition to coaching golf for 15 years, he also coached football, baseball, swimming, and tennis. Jerry became the Golf Coach at Normandy in 1990. He led the Invaders to over 300 Career Victories, the most in school history. He coached five League MVPs, as well as an 8th place finisher in the State of Ohio in 2000. He retired as the Golf Coach with the Most Wins in school history. Jerry was named Coach of the Year multiple times and won multiple League Titles. He was the Plain Dealer Coach of the Year in 2000. Jerry led the Invaders to a School Record of 62 Consecutive Match Wins. Jerry has been happily married to his wife, Shirley, for 48 years. She worked as a speech pathologist for twenty years. They have two children, Leah and Drew, who both followed in their father’s footsteps and became educators. Leah graduated from Toledo, while Drew has degrees from St. Louis University and Notre Dame. Jerry is a resident of North Royalton, Ohio during the summer months and resides in Sun City Center, Florida during the winter. During his time at Normandy, Jerry often made references about the Ohio State rivalry with the “Team Up North.” One of his favorite quotes comes from legendary Coach Woody Hayes, which is “You win with good people”. Jerry certainly did his share of winning while at Normandy with Ten Winning Seasons. Jerry enjoys his retirement playing golf and spending time with his family.